This card was a case of seeing a picture I liked and wanting to make a card out of it. I had previously had a Chevy Chase/Fletch card TTM success with the 1985 Topps baseball template, which I've pictured below. But, like I said, I wanted to do one with this picture. It's looks to be a cool behind-the-scenes shot of Chevy and Kareem goofing around. This time around I used the iconic 1986 Fleer basketball design. This design has no alternate colors so I just masked out the middle. The picture didn't fit just right so I put the white fade in anticipation of Mr. Chase's sig. 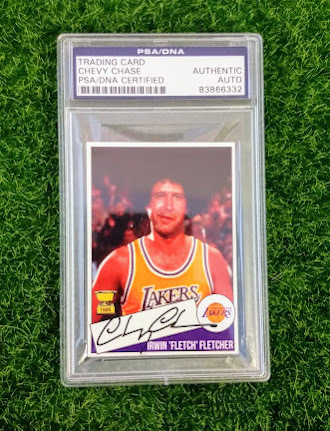 Fletch came out in 1985, but the only basketball cards to chose from would have the 1985 Star. Those are fine and all but not nearly as recognizable as the 1986-87 Fleer are. 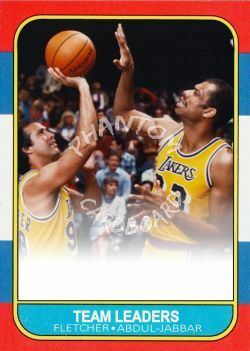 I made this a Lakers "Team Leaders" card so I could make it of both of Fletch and Abdul-Jabbar. I got the idea of course from the old Topps baseball subset. They might still do that, I don't know, haven't collected baseball cards in a minute as the kids say. He's 6'5", with the afro 6'9"